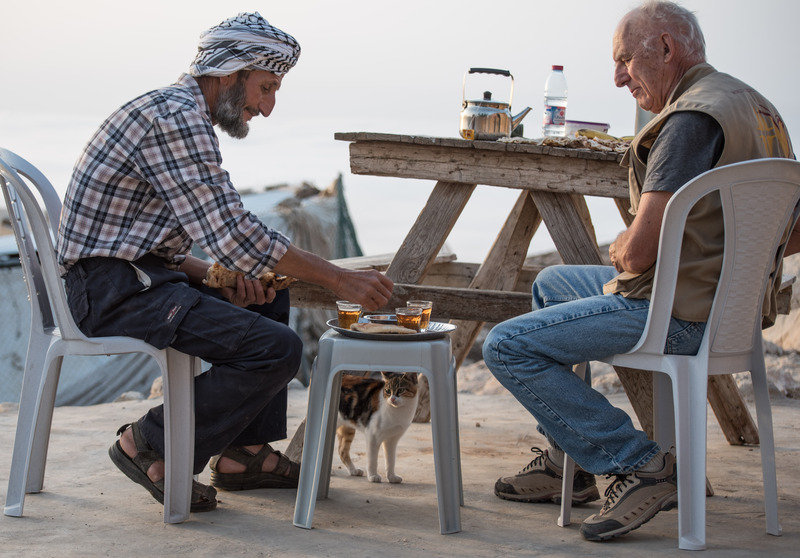 Jibrin sits with quiet dignity and explains the effects of the occupation: ‘Life has become as small as a ring’, he says. Jibrin was born in Qawawis, a community of shepherds in the South Hebron Hills. His family had fields of wheat and barley, sheep and olive trees. Then, in the mid-1980s, the Susya settlement, illegal under international law, was established by the Israeli government on Palestinian land just across the road. Things started to change. The settlers let their animals into the Palestinian fields and damaged the crops. They threw stones at the shepherds. Jibrin’s family moved nearer to the village for protection. It is six o’clock in the morning, and day is about to break over the valley below. In the distance, the foothills of the Negev emerge above the mist. All is quiet and peaceful in Ziad’s tiny homestead, where we have just spent the night. Only the hollering of the jackals and the barking of a lone dog interrupted the silence of last night. Ziad arose well before daybreak to say his two morning prayers, as is his religious custom. He has worked tirelessly all morning feeding fodder and maize to his one hundred and twenty sheep.